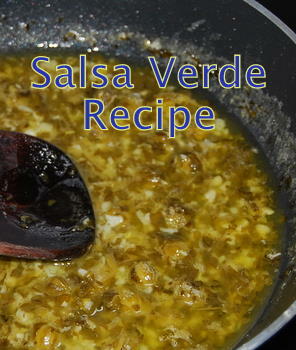 This Easy Salsa Verde Recipe is our own version of the grilled fish sauce famous around the Mediterranean and beyond. With Olive oil, garlic, capers and fresh herbs there's plenty going on to compliment crispy grilled fish chicken or pork. It's a good idea to make up a batch and keep it in the fridge - it'll keep for a week or more at anything less than 4ºc. Our method is easy and healthy too - you can leave out the butter if you like, for a kind of Salsa Verde Light, or if you're counting the calories. 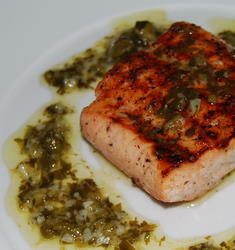 Why not try it with our Mediterranean Grilled Salmon Recipe - it's Great. In a small saucepan cook the garlic slowly in the olive oil - don't allow it to brown, that'll just ruin the sauce. Add the parsley, coriander, lemon juice and zest and stir. Now - whisk in the butter - bit-by-bit to achieve a glossy sauce. Finally - stir in the capers, adjust the seasoning and serve.